The bad news: Intel's new dual-core Atom processors won't be appreciably more powerful than what's in your netbook now. The good news: a Pine Trail netbook reference design Intel introduced today at Computex is only slightly thicker than an iPhone. Intel was able to halve the thickness of the current generation of netbooks with their new Canoe Lake "innovation platform," which employs thermal cooling for Pine Trail netbooks instead of the traditional fans. The end result: a super-slim form factor that also runs less hot than today's models. It's important to keep in mind that this is just a reference design, and that we're likely a long ways off from actually seeing a 14mm netbook on a Best Buy shelf. Those dual-core Atoms, on the other hand, will start showing up in products in time for the holiday. The advances are incremental: improved 720p playback (though you'll still need Broadcom's Crystal HD video decoder for 1080p) and slightly snappier responsiveness. All of which is great—but wake me when Canoe Lake becomes a reality. dual-core and "Oak Trail" processors optimized for tablets and sleek netbook form factors. 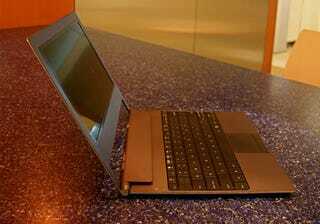 measuring in at 14 millimeters – the world's thinnest netbook. strategy including Windows*, MeeGo* and Google operating systems. segments beyond its growing PC, laptop and server businesses. powered by Intel Atom™ CE products and running Android*-based Google TV*. Intel recently unveiled the future System on Chip (SoC) Atom™-based "Tunnel Creek"
ranging from fish finders to golf carts. codenamed "Sandy Bridge," targeted to be in production late 2010.
consistency and accessibility to their content on a choice of computers and PC-like devices. effortless technologies that empower people at work, home - anytime, anywhere." Windows* 7 and Google operating systems.